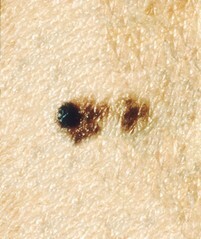 Dysplastic nevus evolving into malignant melanoma. This 40-year-old female member of a melanoma-prone family had a cluster of moles located on her back (a), which were believed to represent dysplastic nevi and were photographed to facilitate subsequent follow-up. When reexamined 18 months later, the upper dysplastic nevus (arrow) had developed a new 3-mm black nodule, which proved to be invasive malignant melanoma arising in a dysplastic nevus.